an Park‚ named after the first Prime Minister of Malaysia. This gazetted place covers an area of 8,990 acres (3,638 hectares). 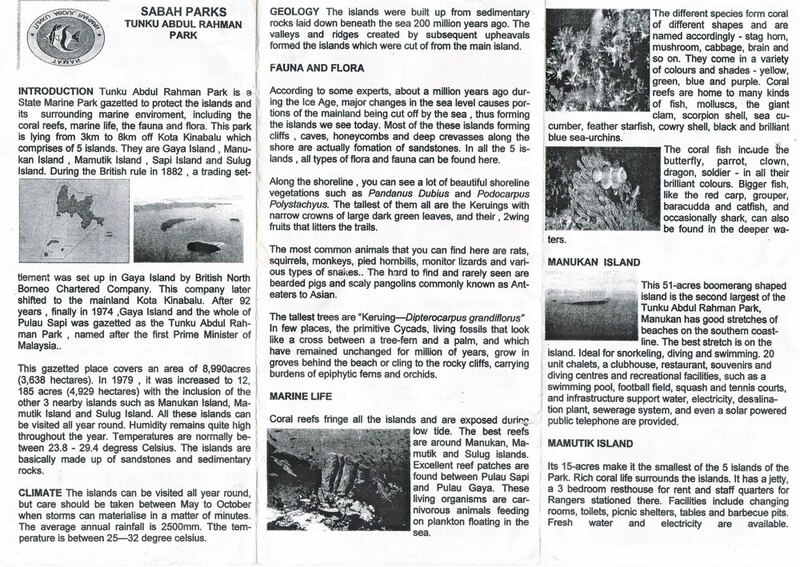 In 1979‚ it was increased to 12,185 acres (4,929 hectares) with the inclusion of the other 3 nearby islands such as Manukan Island, Mamutik Island and Sulug Island. All these islands can be visited all year round. Humidity remains quite high throughout the year. Temperatures are normally between 23.8 - 29.4 degress Celsius. The islands are basically made up of sandstones and sedimentary rocks. The islands can be visited all year round, but care should be taken between May to October when storms can materialise in a matter of minutes. The average annual rainfall is 2500mm. Tthe temperature is between 25—32 degree celsius. The islands were built up from sedimentary rocks laid down beneath the sea 200 million years ago. The valleys and ridges created by subsequent upheavals formed the islands which were Gut of from the main island. shore are actually fomation of sandstones. In all the 5 islands, all types of flora and fauna can be found here. Along the shoreline, you can see a lot of beautiful shoreline vegetations such as Pandanus Dublus and Podocarpus Polystachyus. The tallest of them all are the Keruings with narrow crowns of large dark green leaves, and their, 2wing fruits that litters the trails. The most common animals that you can find here are rats, squirrels, monkeys, pied hombills, monitor Iizards and various types of snakes.. The hard to find and rarely seen are bearded pigs and scaly pangolins commonly known as Anteaters to Asian. The tallest trees are “Keruing—Dipterocarpus grandiflorus“ In few places, the primitive Cycads, living fossils that look like a cross between a tree-fern and a palm, and which have remained unchanged for million of years, grow in groves behind the beach or ding to the rocky cliffs, carrying burdens of epiphytic fems and orchids. Coral reefs fringe all the islands and are exposed during low tide. The best reefs are around Manukan, Mamutik and Sulug islands. Excellent reef patches are found between Pulau Sapi and Pulau Gaya. These living organisms are carnivorous animals feeding on plankton floating in the sea. mushroom, cabbage, brain and so on. They come in a vanety of colours and shades - yellow, green, blue and purple. Coral reefs are home to many kinds of fish, molluscs, the giant clam, scorpion shell, sea cucumber, feather starfish, cowry shell, black and brilliant blue sea-urchins. This 51-acres boomerang shaped island is the second largest of the Tunku Abdul Rahman Park, Manukan has good stretches of beaches on the southern coastline. The best stretch is on the island. Ideal for snorkeling, diving and swimming. 20 unit chalets, a clubhouse, restaurant, souvenirs and diving centres and recreational facilities, such as a swimrning pool, football field, squash and tennis courts, and infrastructure support water, electricity, desalination plant, sewerage system, and even a solar powered public telephone are provided. Its 15-acres make it the smallest of the 5 islands of the Park. Rich coral life surrounds the islands. 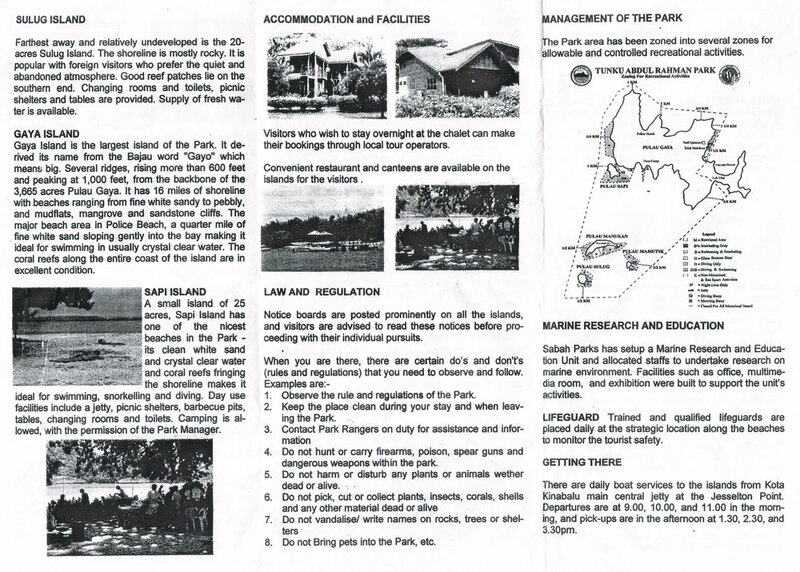 It has a jetty, a 3 bedroom resthouse for rent and staff quarters for Rangers stationed there. Facilities include changing rooms, toilets, picnic shelters, tables and barbecue pits. Fresh water and electncity are available. Farthest away and relatively undeveloped is the 20-acres Sulug Island. The shoreline is mostly rocky. It is popular with foreign visitors who prefer the quiet and abandoned atmosphere. Good reef patches lie on the southem end. Changing rooms and toilets, picnic shelters and tables are provided. Supply of fresh water is available. Gaya Island is the largest island of the Park. It derived its name from Hie Bajau word “Gayo“ whichmean big. Several ridges, rising more than 600 feet and peaking at 1,000 feet, from the backbone of the 3,665 acres Pulau Gaya. It has 16 miles of shoreline with beaches ranging from fine white sandy to pebbly, and mudflats, mangrove and sandstone cliffs. The major beach area in Police Beach, a quarter mile of fine white sand sloping gently into the bay making it ideal for swimming in usually crystal clear water. The coral reefs along the entire coast of the island are in excellent condition. tables, changing rooms and toilets. Camping is allowed, with the permission of the Park Manager. 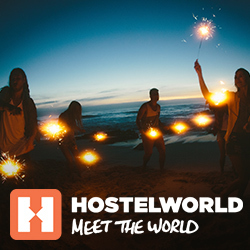 Visitars who wish to stay overnight at the chalet can make their bookings through local tour operators. Convenient restaurant and canteens are available an the islands for the visitors. Notice boards are posted prominently on all the islands, and visitors are advised to read these notices before proceeding with their individual pursuits. When you are there, there are certain do‘s and don‘t‘s (rules and regulations) that you need to observe and follow. 1. Observe the rule and regulations of the Park. 2. Keep the place clean during your stay and when leaving the Park. 4. Do not hunt or carry firearms, poison, spear guns and dangerous weapons within the park. 5. Do not harm or disturb any plants or animals wether dead or alive. 8. Do not bring pets into the Park, etc. Sabah Parks has setup a Marine Research and Education Unit and allocated staifs to undertake research an marine environment. Facilities such as office, multimedia room, and exhibition were built to support the unit‘s activities. to monitor the tourist safety. There are daily boat services to the islands from Kota Kinabalu main central jetty at the Jesselton Point. Departures are at 9.00, 10.00, and 11.00 in the morning, and pick-ups are in the afternoon at 1.30, 2.30, and 3.3Opm.